While the springing of spring already happened, I sort of missed it. You know, I was doing things like being sick, running, napping, covering myself in Vapo-Rub, coughing up that pesky lung, losing my voice, almost getting hit by a cop car late at night*, and running some more. So, I never got to tell/show you how the arrival of spring tends to make me think I’m living the life of a Bizzaro Disney princess. And not the hipster ariel kind of alternative Disney princess. My glasses aren’t that cool. They're not medically necessary. When the revolution comes, I'll still be the one leading you. 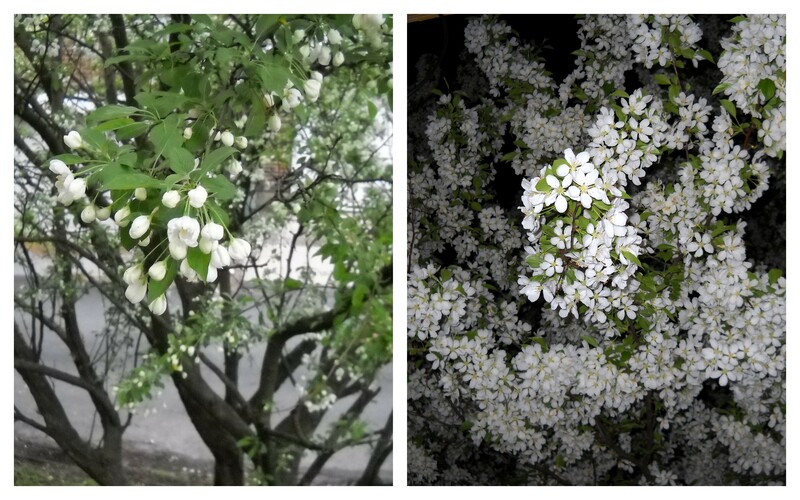 Day/early blooms on the left, night/full bloom on the right. It’s also really tempting to step out onto the deck at night to try to get a picture of the big, white cave that surrounds my bedroom. And while I made a really good effort, trying to get the whole darn thing in a picture was so not happening. Like I said, though, the whole thing is cool but fleeting. And full of pollen. Luckily, I was already too clogged up in the sinus department to care. The things that really make me an off-brand Disney princess, though, are attitude and luck. I am so NOT a candidate for princess-ship. My hair is far too frizzy, I don’t live close enough to a forest, I have failed to cultivate truly evil enemies, and none of my friends are talking hermit crabs. 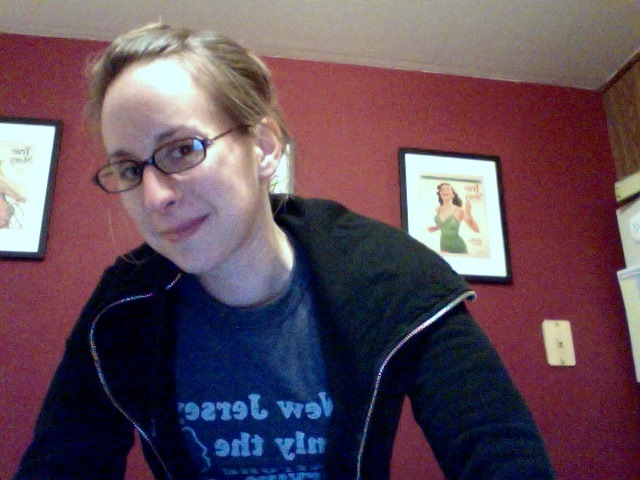 In addition, I’ve got the dress code all wrong; I only recently stopped actively avoiding wearing pinks and purples**. And, let’s face it, my off-key singing isn’t going to get me a set of legs or a magic carpet or a castle any time soon. Especially since my songs would mostly be about how much I want someone else to cook dinner or why taylor ham, egg, and cheese sandwiches are the best breakfast sandwiches. Also, I’m pretty sure princesses aren’t supposed to enjoy fart jokes. But if I ever needed confirmation that the elements of a princess movie can come together in my life and somehow get rearranged to fit the rules of my existence, I need look no further than right outside my window. I got this through the trusty "hand out the door" method. While Cinderella can get her mouse friends to do some light sewing and singing for her and Sleeping Beauty can get birds to dress her, I got my own little hostage situation. 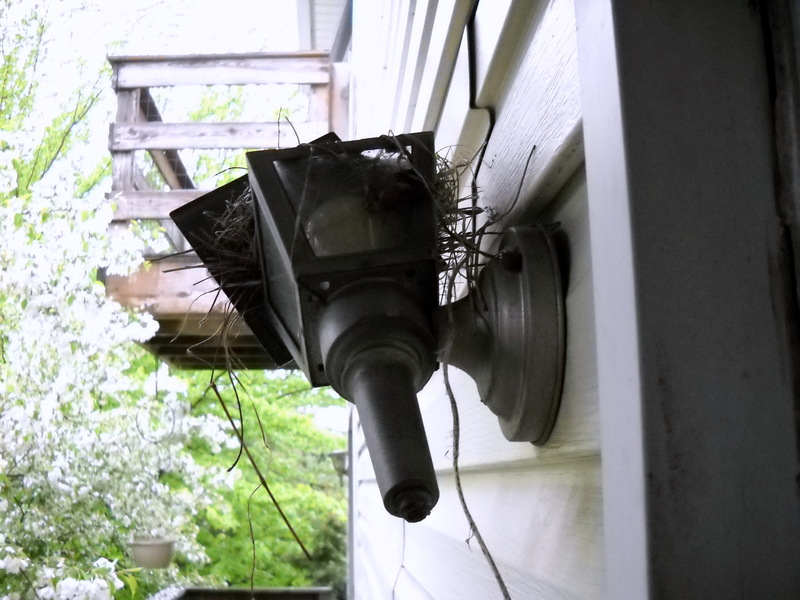 Because this nest is literally right next to my head when I step out onto the deck, I’ve decided to cede the space to the robin smart enough to build her home in my deck light. Personally, I think it’s a beautiful sign of spring to have birds hatching so very nearby. Also, the mother bird gets really pissy and aggressive if the door’s open too wide, so I’ve decided not to bother her. And, I think touching a bird’s nest is icky. The situation isn’t without its perils, though. Yesterday, I accidentally turned on the light. I’m still recovering from my heart attack. * It’s a good story, but needs more visual aids (I’d need a white board, at least) than I can provide here. It also needs the person who spent the rest of the night telling everyone he met that I almost got hit by a car — a cop car! — interrupting every thirty seconds or so with that information to really punch up the narrative. Basically, this is the wrong venue. It’s an in-person, multi-teller story. ** I might have realized I didn’t look half bad in them. Vanity, 1; Silly principles about colors, 0.